Autonomic, known for supplying the custom electronics industry with award-winning high performance cloud-based media solutions, has announced the introduction of newly developed control system interface modules, making the Mirage Media Server and Mirage Audio System compatible with KNX while enhancing functionality with Control4 and RTI. Autonomic will be exhibiting at 2014 ISE Booth 5-R97 in Amsterdam February 4-6, 2014 and will also have a kiosk within the Control4 booth (10-N114). The ISE event is expected to attract more than 45,000 attendees from 140 countries. KNX control compatibility, developed in-house by Autonomic, provides more options for European distributors, integrators and consumers seeking extended control of Autonomic’s Mirage Media Servers and Mirage Audio Systems. KNX is a worldwide building automation standard with more than 330 manufacturing members in more than 35 countries and a market leader in Central Europe. For Autonomic integrators in the region, KNX compatibility enables them to deliver a cloud-based distributed audio solution within the popular KNX platform. KNX’s standardized open control protocol makes Autonomic products compatible with hundreds of styles of controls interfaces. Leveraging a KNX IP Gateway provides extended keypad control for up to 32 zones and 100 presets of programming selected from both local content and Autonomic’s wide array of streaming internet based music services. User presets could be set to any Napster artist station or customized playlists created from Spotify, Napster, and local music content. User available functions include volume up/down, zone on/off, play, stop, skip and back from any KNX-enabled zone controller. Add LED metadata feedback and Autonomic delivers the seamless KNX integration that integrators and their clients are asking for. Newly constructed from the ground up by Autonomic, the iPad-based RTI module provides a completely new and improved user experience. The enhanced functionality enables easy and intuitive browsing of local content and streaming services via the interactive navigation screen, which displays artist, cover art, album, track number, track time elapsed—everything you need all on a single screen. Also as part of the colorful and robust RTI control experience, a bold icon indicates which streaming service is supplying current programming so users always know the source of their content. Another feature of the new RTI interface is the ability to add streaming service accounts on the fly. Once a streaming service has been selected – such as Spotify or Napster – quick searching becomes a snap with the fully functioning keyboard. Users can easily build queues and save customized playlists for the most pleasurable experience. Autonomic’s proprietary TuneBridge™ technology has been optimized within the RTI module, featuring a prominently displayed activation button in the upper right hand corner of the interface. Users can easily switch between enjoying local content and streaming services with TuneBridge as part of the enhanced functionality within the RTI control module. Autonomic is pleased to announce enhanced collaboration with Control4 resulting in the development of a superior interface module and enhanced user experience for the Mirage Media Server in a Control4 environment. The new module has been developed in- house by Autonomic, making access to control drivers easier for the integrator and eliminating any need for license keys as required for the prior solution. In-house development also means faster access to updates as the module gains speed, programming options, and other new features. Future Autonomic/Control4 co-development lays the foundation for quicker-to-market modules and updates as Control4 develops and releases new versions of their control platform. 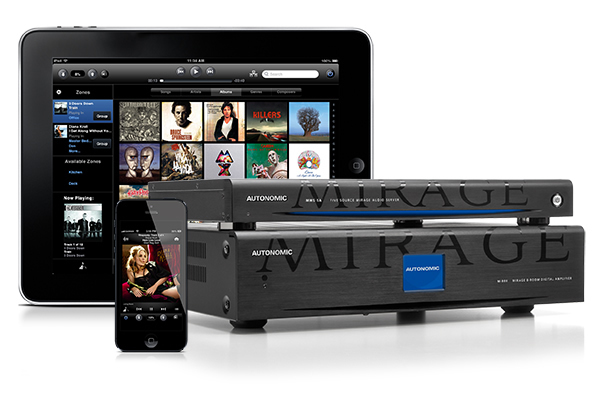 At the 2014 ISE, Autonomic will have a demonstration kiosk within the Control4 booth (10-N114) featuring an active Mirage Media Server and M-400 amplifier demonstrating the newest Control4 interface. “Evolving partnerships and in-house development of control modules are a critical part of what Autonomic has delivered to integrators since the company was founded,” explained Aaron Chisena, Director of Sales and Marketing at Autonomic. “It has always been our mission to give integrators the necessary tools they need, enabling them to provide the very best multi-room audio experience for their customers. Whether it’s the standalone Autonomic Mirage Audio System or an integrated solution featuring a Mirage Media Server, the consumer experience remains consistent – pure musical bliss,” Chisena concluded. Please see Autonomic at 2014 ISE Booth 5-R97.